GRAND CAYMAN, CAYMAN ISLANDS—Kimpton Hotels & Restaurants has opened its first Caribbean property, Kimpton Seafire Resort + Spa, here along Seven Mile Beach. Seafire marks the boutique hotel brand’s first foray into the international luxury resort market. 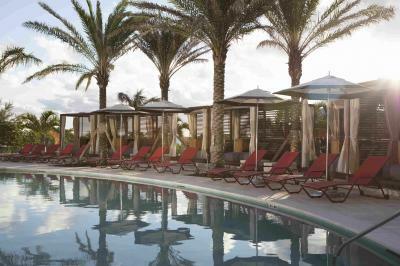 The resort pays tribute to the classic Caymanian culture and aesthetic, while introducing modern elements and amenities, according to the brand. Situated 24-ft. above sea level, many of the property’s 266 guestrooms offer a private balcony with views of the pool, ocean or surrounding landscape. On-property dining includes its signature restaurant Ave; a casual beach bar named Coccoloba; and Avecita, a nine-seat chefs’ bar, featuring meals cooked on a wood-fired grill and plancha. There are also two pool bars. The resort has indoor and outdoor meeting spaces, including the 7,076-sq.-ft. Aurea Ballroom, a Presidential Suite, as well as an expansive Seabridge Green event lawn. Other amenities include an 8,500-sq.-ft. Spa at Seafire; a 1,770-sq.-ft. fitness center with weekly group fitness classes; and Camp Seafire, which offers interactive programs for children.